Upon Garcia’s official petition drive in late October, he earned more than 63,000 signatures to win a slot on the ballot. After a vigorous push from volunteers, the city faced a non-partisan mayoral run-off. 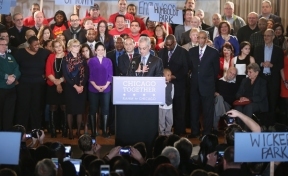 ““In the last fifteen years, Chicago has lost over 200,000 people who just up and left,” said Garcia. “You can’t have a thriving city unless people are moving here, not leaving. That means a growing middle class, not a shrinking one — a less violent city, with great schools and thriving neighborhoods. A prosperous, growing city won’t have a pile of bills it can’t pay and a pile of forgotten people it can’t care for.